There are few things I love as much as a good hand cream, and while I’ve found some solid favourites over the years, the product junkie in me is always up for seeing what’s out there and trying new things. I’ve been testing out several new-to-me hand creams over the last few months and, while none of them have quite overtaken my longtime favorite -- the Trilogy Ultra Hydrating Hand Cream -- I have discovered some good ones, including a new lightweight favourite that’s perfect for the warmer months or for those times when you just don’t need as intense of a lotion. These two hand creams are my first products from German-made Alva and I like them both a lot. The richer Sea Buckthorn formula is my favorite of the two, mainly for its fresh lemony scent, but also because, made with shea and cocoa butters, it feels a little more nourishing. The original hand cream smells mostly like tea tree oil to me, with just a hint of citrus coming through underneath. Both creams moisturize very well and absorb reasonably quickly too. The Aromatic Repair & Brighten Hand Cream promises to hydrate and nourish skin while helping diminish dark spots and pigmentation. I don’t have dark spots or pigmentation on my hands so I can’t speak to those claims, but as a moisturizing product, it’s pretty fantastic. The hand cream is thick but not heavy, and feels very healing on dry, dehydrated, or chapped skin. It’s also great on dry cuticles. The cream isn’t oily or greasy, but it does take a minute or two to fully sink in. The scent -- a blend of vetiver, ylang ylang, lavender, patchouli, bergamot, juniper, rosemary, and lemon -- is herbal, floral and just generally lovely. This is definitely one of the more strongly fragranced natural hand creams I’ve used and the scent does linger on the skin. At £28/$52 USD for 75 ml, it's a pricey hand cream, but if you have the money and want to splurge, it's a beautiful product. Way at the other end of the price spectrum, we have the Benecos Sea Buckthorn & Orange Hand & Nail Cream, retailing for a mere £2.08 -- or, a little higher in North America at ±$9 CAD -- for the same 75 ml. After mixed experiences with Benecos products, I purchased this cream without high expectations, but it is undoubtedly my favourite discovery of the bunch. The Hand & Nail Cream is lightweight and quick to absorb, and it leaves skin silky soft and deeply hydrated. I also adore the product’s light and fruity scent, which comes from a mix of essential oils and natural fragrance. I know the cream is supposed to smell like oranges, but it also smells a little peachy and a little green/herbal to my nose. The scent is beautiful, but also light and inoffensive. Seriously, I don’t know why more people aren’t talking about this guy! Lavera makes some fantastic products, but the hand creams were pretty unimpressive to me. Both versions have alcohol as the fourth ingredient and they just don’t offer any kind of long lasting moisturization. The creams feel nice enough in the moment, but within an hour or two, my hands are dry again, almost as if I hadn’t used anything at all. In terms of scent, the Basis line is pretty unobtrusive to my nose, but the Hand & Cuticle Cream wasn’t a favourite -- to me, it smells a little old-fashioned and a little like sunscreen. Lavera’s two hand creams did not impress me, but the other four are all solid products in my book. 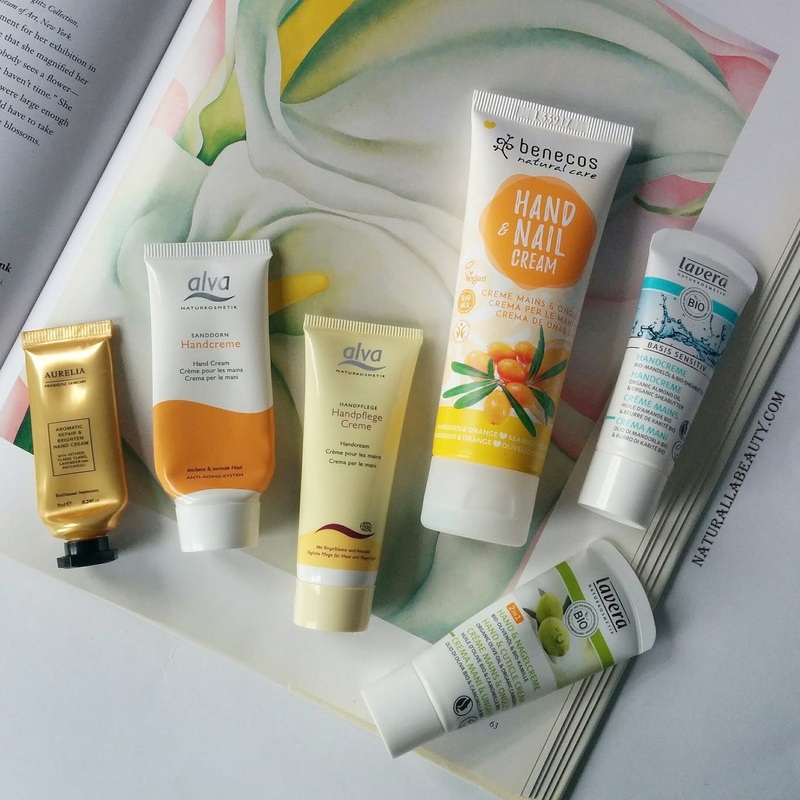 I’m especially smitten with the budget-friendly Benecos Sea Buckthorn Hand & Nail Cream and I also wouldn’t hesitate to rebuy the Alva Sea Buckthorn Hand Cream.